Happy World Sleep Day! Sleep is so central not only to Ayurveda but to all of our lives, and what better way to honour our favourite activity than by giving it its own day? For centuries, humans have fought sleep in one way or another. Sleep is a weird one — we love it and hate it all at once. It’s one of the most sensual tools, and free to boot, you can have in your health and beauty arsenal. After all, who doesn’t love a lush bed and their pillows exactly how they want them? Yet we push back against it, staying up late, going against the natural wind-down that happens as the sun sets, instead staring at screens and allowing bright light to mess with our melatonin (a hormone that regulates sleep and other biorhythms) production and ultimately our circadian rhythm. To make matters worse, we sometimes depend on artificial sedatives to help us fall asleep or wait until we are so fatigued we “pass out,” then rely on a hit of caffeine to get us going the next day. A lot of the time, it feels like we’re either super lazy or have a terrible relationship with sleep. Many of you may have already glazed over, thinking “I know all this already, but I am just too busy and I can get by.” But there IS enough time to sleep — we just need to make it our priority. Read on to find out why a good wind-down routine will enable quicker and deeper sleep, and make that sleep both more efficient and more enjoyable. You’ll start waking up with more vigour, creativity and energy — you won’t believe the glow. Sleep is one of the key pillars of Ayurveda, because the rest we get (or don’t get) determines so much of our overall health. Like our diet, it contributes to how we feel, how we act and how we react to events in our everyday: lack of sleep can make us irritable and prone to overeating, and in-time lead to illness. Western science aligns with the Ayurvedic notion that anyone over the age of 18 needs between 7 and 9 hours of sleep every night, but most of us aren’t getting those hours in. In 2017 research commissioned by The Sleep Council revealed that a whopping 74% of the British population admitted to sleeping fewer than 7 hours every night, while 30% of people questioned said they experienced poor sleep. Sleep is the time for your body to heal and repair itself and is seen as the best remedy (along with warming, easy-to-digest foods) for when you’re feeling run down or have a cold. Think about it: when you weren’t feeling well as a child rest was always understood to be best, but as professionals in busy environments, we all feel pressure to power through and exhaust our bodies’ resources even more, which is so counterintuitive! Without proper sleep, everything else gets out of whack. 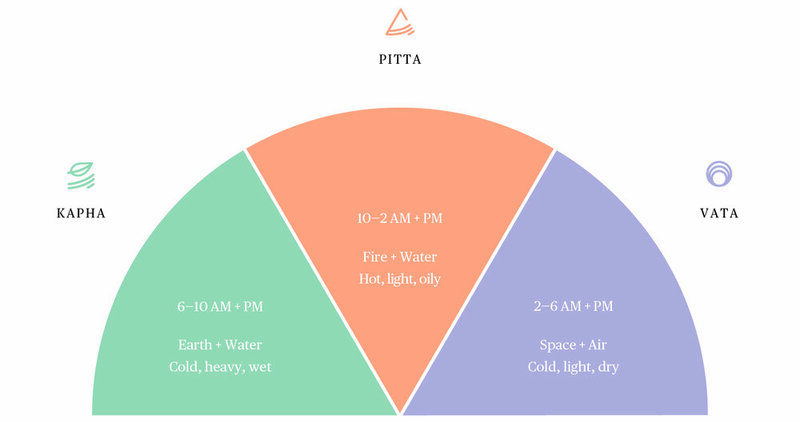 According to the Ayurvedic Clock, there are six four-hour periods of the day, each one characterised by one of the Doshas (see below). This means that there are optimal times to eat, exercise and — you guessed it — sleep. I get my best nights’ sleep when I follow this natural rhythm, going to bed before 10pm and waking up before 6am. The best rest is said to occur between these hours: if you think about how the rhythm of the universe works — the moon pulling the tides, etc. — then energetically, there is that effect on the body. Think about life on a farm: the animals all start stirring just before sunrise — it’s an early wake-up call for the farmer! Have a look at the diagram below, along with the explanations, to understand more about how our energy works throughout the day. Then try to think about how you feel at different times of day, and see if this shines light on any patterns! 2-6am: Rising before 6am will allow you to reap all the benefits of Vata, i.e. energy and creativity. 6-10am: This is prime Kapha time, so keep your energy up by exercising and enjoying a light cooked breakfast. 10am-2pm: This is your time to tackle those spreadsheets and the like; you’ll find you’re at your most productive between these times. Have your biggest meal around noon, when your digestive system is at its strongest. 2-6pm: Get your diary together in the afternoon. You’ll be best able to tackle problems then as well. 6-10pm: Kapha time again! This is when your day comes full circle and you should start to wind down and follow my tips for a restful night. 10pm-2am: Get that shut-eye between these times, allowing your body to fully process all the energy and stimulation from the day. Good sleep isn’t only about the times of day: the seasons also play a part. Since healthy sleep patterns are linked to the rhythm of the Earth, you’ll find you naturally need less sleep in the summer, when the sun sets later, as our circadian rhythms are regulated by natural light. Of course, many of us want to go to bed earlier but can’t due to travel, young children or working night shifts, for example. Then the idea of getting “enough sleep” and at the “right time” becomes contentious. If you feel it impacting your health, then it’s worth thinking through the consequences and seeing if you can make a plan to prioritize your health. I travel a lot — and I love it — but the buzz can get the better of me, so meditation helps me to catch up on some physical and mental healing. I practise it for 10 to 30 minutes while I’m in the car, on the tube or on a plane, and I allow myself to make sleep or lack of it a non-issue. After all, there’s no use stressing about it, or you end up in a vicious cycle! So if I’m woken by my alarm, we’ve arrived at our destination or it’s time to get to an appointment, if I’m tired, or wired, then I do some alternate nostril breathing to calm myself and practise acceptance. If I wake up because my mind is going a million miles per hour, then again I do breathing exercises, make myself a little hot water to drink, stretch and then go back to bed again and practise watching my breath to stop my mind wandering or overthinking the fact that I’m awake in the wee hours. Unless I’m truly exhausted and desperate for catch up on sleep, I try not to lie in as it throws my whole day out and then I’m wide awake when I should be going back to my normal routine — again the cycle goes out of whack. I prefer to get up, pop in a meditation or three and then it’s back to usual. It’s not just our bodies that need rest, but our minds too, according to Ayurveda and the circadian rhythm studies conducted by Western science. When you don’t get enough sleep, you end up going through in a wired state — and because you are still functioning, you start to believe that you are OK and that sleep isn’t even that important, even though it really, really is. Eat a small, highly digestible meal, such as my Kitchari or Winter Sunset Soup, 2-4 hours before bed, to give your body time to process the food. Opt for well-cooked foods as opposed to anything raw, as these are considered Rajasic, or overstimulating. Warming soups or Golden Milk are amazing to help you sleep, but you might need to rethink that late-night raw apple habit. Instead of turning to chemical sleep aid pills, try a herbal tea — I love the Pukka range, and their Relax Tea is perfect for calming that Vata. Avoid exposure to screens after 6pm — the glare of your tablet is way too stimulating. Download the f.lux app for your laptop and use Night Shift on iPhones and Androids, both of which turn your screen into an orange light rather than blue to more closely mimic sunset and sunrise lighting. Turn off the bright lights! Instead, opt for dimmer mood lighting in the evening. If you must have caffeine, drink it in the morning. Keep your alcohol consumption at a minimum whenever possible, since a tipple can mess with the quality of your sleep. Face your worries before bed: a stressful event earlier in the day, even if you feel you’ve already dealt with it, might affect your sleep. Imagine them, correct them and then you’ve properly dealt with them. I call this: WHITEBOARD WORRIES in my book East by West. Address your fears by miming writing them in front of you and wiping them away; replace with positive affirmations. Treat yourself to a foot soak and face massage before bed. The warm water helps to ground you and get you back into your body, while the face massage helps ease away tension from the day. A little self-care ritual; add some self-love affirmations. Use essential oils — a dash of lavender or Roman chamomile on your pillow can go a long way to soothe you. Neom does a whole kit for sleeping. Meditate! This practice does wonders for calming your brain and all the Vata energy from your day. See below for a guided meditation video from Deepak Chopra, or check out my Resources page for more on this. If you’re able to, avoid having naps throughout the day, as this will disturb your circadian rhythm. Go for deep breathing or a walk in nature, or look up at the sky and smile instead. A meditation will also help if you feel yourself crashing. 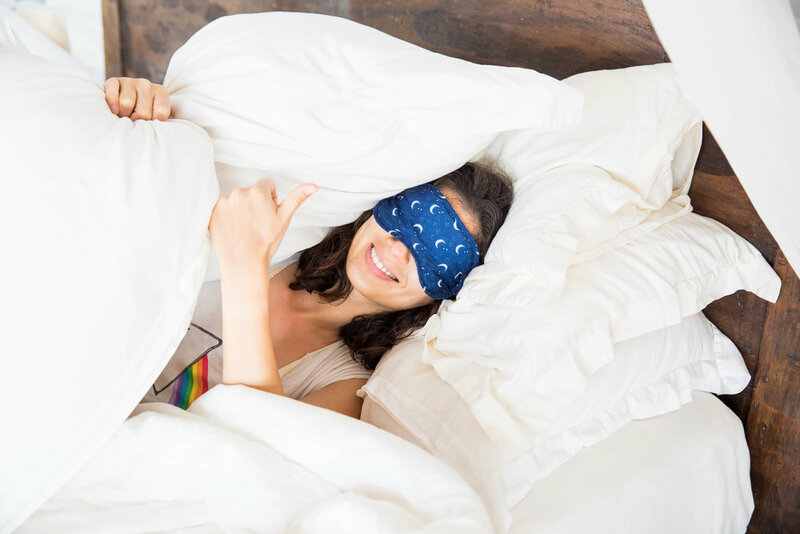 Block out any disrupting light with a pretty eye mask. If your sleep has been really off lately, it might have something to do with the change of seasons. Sign up to my newsletter to receive my free 3-day Cleanse + Reset plan to help re-adjust your body. If you have trouble winding down early or getting up early and you feel your rhythm is really out of whack, then the best advice I’ve heard and given is to go camping for a long weekend or week if you can with a good book and a torch — no screens! Your body will naturally start winding down without the artificial stimulation, and you’ll start yawning as the sun starts to set and within a few days, you’ll be waking up bright as a button as the sun rises. Problems with sleep are associated with Pitta and Vata imbalances, so make sure to read up on what causes these Doshas to become irritable, on my website and in my book East by West. Follow the tips above if you’re having trouble, and try to stay away from any extraneous stimulation if you can. Sleep tight! These yoga and meditation vids really help me settle down for the evening if I’ve had a particularly stressful day (or not!). Just make sure you keep your screen’s brightness low and in flux mode (an orange light, rather than the default blue) and only use it to press play and pause, so as not to disrupt your circadian rhythm unnecessarily. You can just listen to the videos, instead of watching them. These range in length from 3 minutes to 20 (from left to right and top to bottom — and one after the other for those of you reading on your phones), so you can pick your medicine!